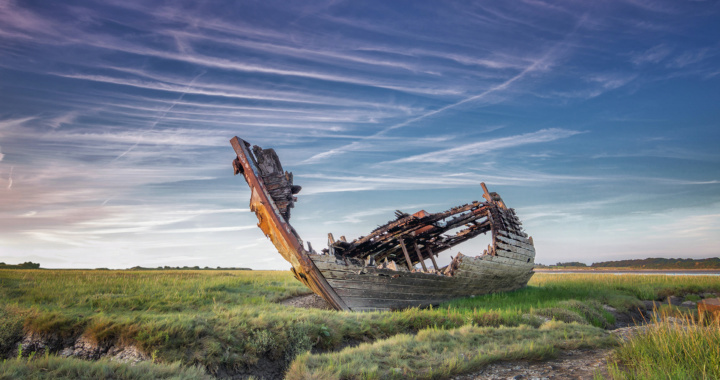 The Fleetwood Wrecks are a group of old fishing boats abandoned on Fleetwood marshes, next to the River Wyre, which are slowly rotting away. It is possible to walk up to them, but wellingtons are definitely required in the winter months when the ground can become extremely boggy. Care is also required at high tide as there are some deep channels on the marshes. Take the A595 towards Fleetwood and shortly after the sign welcoming you to Fleetwood, turn right at a large roundabout with a statue of Eros, then second left onto Jameson Road. Keep on this road until the car park at the Fleetwood Marsh Nature Reserve is reached. From the car park, there is a footpath that crosses a bridge between two ponds which gives a chance for some bird spotting. Continue on the footpath and the wrecks come into view on the River Wyre to the right. Some of the wrecks have been identified – most notably the Clarain FD119. Posted in Lancashire and tagged Coast.